Sadly, that isn’t enough to lift this above average. The enthusiasm is definitely there, but the song-writing isn’t strong enough to make this a must-have. Each song sounds like the one before it and you’ll have heard all their tricks before you even get halfway. It’s not terrible by any stretch of the imagination, but it’s also not mind-blowing. This is a solid six out of ten at best, it should score them a few good support slots but isn’t enough to herald a new dawn in Antipodean thrash. 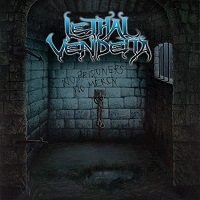 This is a shame because on first glance, Lethal Vendetta have everything going for them. They’ve got some decent riffs up their sleeves and in singer Brent Logan they have a charismatic frontman. His voice is part Joey Belladonna, part air-raid siren and while it’s likely his pipes will divide audiences, he’s an engaging presence and provides their most distinctive factor. And yes, some of the songs are decent enough. ‘Deserve To Die’ and the title track are reliable cuts of meat and potatoes thrash, while ‘Erasing Hate’ is a an impressive exercise in axe-slinging. However there’s also a couple of unremarkable efforts like the opening ‘Liar’s Dice’ clogging up the track list. Plus, there’s ‘Salute To The Gods,’ a homage to the awesomeness of heavy metal which must have been written during a night on the sauce. It’s earnest and charming, but it’s also dangerously cheesy and comes too close to cringe-inducing to be truly rewarding. That isn’t to say this is a disaster, far from it. The trouble is that at present, Lethal Vendetta occupy an awkward middle ground of being fine, but not brilliant. They’ve got the musical chops to go the distance and to be fair, they are only just starting out so may have some killer records in their future. ‘No Prisoners, No Mercy’ feels like a stepping stone at best and they’re going to have to tighten up their song-writing skills if they want to stand out from the increasingly crowded thrash scene. ‘No Prisoners, No Mercy’ is released on Saturday (20 April). You can get your copy HERE.